Prominent & Leading Exporter from Ahmedabad, we offer ceramic fiber fabric. 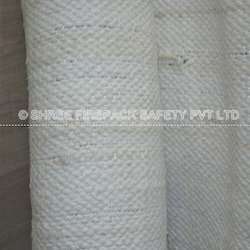 Shree firepack safety pvt ltd manufacturers supplier for ceramic fibre rope, braids, cloth tapes, and blankets. ceramic fibre cloth also contain reinforcement insert materials of either inconel wire or continuous fibreglass filament to increase handling strength during installation and enhance fibre durability to rated temperatures of 2000 °f (1093 °c) for inconel wire and 1200 °f (649 °c) for fibreglass filament. applications of ceramic fiber cloth include :• expansion joints• safety blankets• curtains• welding blankets• protective and insulating covers• shields, gaskets, cable or pipe wrapping, etc. Looking for Ceramic Fiber Fabric ?